To provide financial assistance to meritorious students from low income families to meet a part of their day-to-day expenses while pursuing higher studies. The scholarships are awarded on the basis of the results of Senior Secondary Examination. 82000 fresh scholarships per annum [41000 for boys and 4 1000 for girls) are awarded for pursuing graduate I postgraduate studies in colleges and universities and for professional courses, such as Medical, Engineering etc. The total number of scholarships are divided amongst the State Education Boards based on the State’s population in the age group of 18-25 years, after segregating share of CBSE and JCSE on the basis of number of students passing out from various Boards in the country. 50 % of the scholarship is earmarked for girls. The number of scholarships allotted to a State Education Board is distributed amongst pass outs of the Science, Commerce and Humanities streams in the ratio of 3:2:1. In case of shortfall in the number of applications, the scholarship slots could be inter- changed. Students who are above 80th percentile of successful candidates in the relevant stream from the respective Board of Examination in Class XII of I0+2 pattern or equivalent and pursuing regular courses (not correspondence or distance mode) in Colleges/Institution s recognized by All India Council of Technical Education, UGC Act, 1956, Medical Council of India, Dental Council of India and respective regulatory authorities and not availing benefit of any other scholarship scheme including State run scholarship schemes/Fee waiver and reimbursement scheme are eligible under the scheme. Students pursuing Diploma courses are not eligible under the scheme. Students belonging to reserved categories/weaker sections /minorities are eligible on the basis of merit, subject to Central Reservation Policy and internal earmarking. Reservations for the various categories are as follows: Scheduled Castes (SCs) 15 %, Scheduled Tribes ( STs) 7.5 %, Other Backward Classes(OBCs) 27 % and horizontally 5 % for Physically Handicapped I Persons(s) with Disabilities (PwDs) in all the categories. 1) National Scholarship Portal (NSP) www.scholarships.gov.in will be opened for online application in the month of June-July every year. 2) Class XII pass out students of the current Academic Year, who are above 80th percentile of the respective State Education Boards (SEBs) are eligible under the scheme and can apply on National Scholarship Portal (www.scholarship.gov.in), before the cut-off date. Physical application would not be accepted. (i) By the Institute where the student is studying. (ii) By the respective State Education Board. 4) Applicant is required to submit requisite documents, such as [Class 12th Mark sheet, Income Certificate] to the Institute. 5) Application which is not verified either by the institute or by the concerned State Education Board or by both will be treated as ‘Invalid’. 6) Merit list as per the State allocated quota would be generated from the verified applications. The rate of scholarship is Rs.l0000/-per annum at Graduation level for first three years of College and University courses and Rs.20000/- per annum at Post­ Graduation level. Students pursuing professional courses, in case, where the duration of course is five (5) years/Integrated course would get Rs.20000/- per annum in the 4lh and 5lh year. However, students pursuing technical courses such as B.Tech., B.Engg would get scholarship up to graduation level. The parental/family income ceiling is Rs.8 lakh per annum for all categories under the scheme and would be applicable from the Academic Session 2018- 19. Income certificate would be required for the fresh applicants only. A student will be eligible for the scholarship for a total duration not exceeding S years. A scholarship under the scheme is renewable on year to year basis up to Post Graduate level in the same stream (except for the students pursuing technical courses leading to degree at graduation level). If a scholar is unable to appear in the annual exan1ination owing to illness and or on account of any unforeseen event, the award may be renewed for the next academic year on submission of medical certificate and other proof to satisfy the Head of the Institution who will certify that the student would have passed with required percentage of marks or equivalent Grade Point Average, had he/she appeared in the examination. A scholar would be allowed to continue/renew his/her scholarship if, he/she changes the course of study to a stream not offered by his school Board in Class XII (e.g. Law, Fashion Technology, etc.). Students changing their college/institute of study would be allowed to continue/renew the scholarship provided the course of study and the institution is recognized. (vii) Certificate of identity having photo of such member issued by a Gazetted Officer or a Tehsildar on an official letter head; (viii) Identity Card issued by the college or institute or university. Further, the students are required to have the bank accounts opened, especially, in their name for availing the benefits under the scheme. The scholarship will be disbursed directly into the bank accounts of the beneficiaries through Direct Benefit Transfer (DBT) mode. 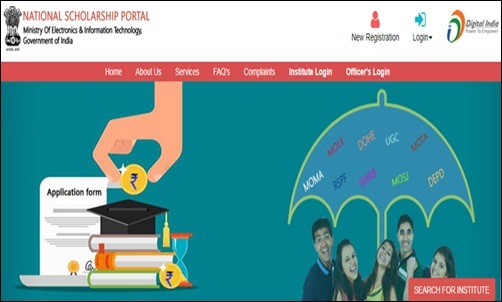 The student can track their payment status from the template “Know Your Payment” in the Public Financial Management System (PFMS) portal (https://pfms.nic.in/User/LoginDetails/Login.aspx) either by indicating Aadhaar number or bank account number. (c) that the student is not involved in any ragging activities. (c ) that the student is not involved in any ragging activities. Students who have passed Class xii and have received fresh/renewal scholarship through the National Scholarship Portal (NSP) must apply online in the National Scholarship Portal (www.scholarships.gov.in) for the renewal scholarships. The 50 % and above criteria will be applicable prospectively i.e. for renewals becoming due from 2018-19 onwards. Renewal applications sent directly to the Ministry of Human Resource Development shall not be accepted.